Paulist Fr. James Lloyd, 98, is the oldest-living Paulist Father. He was born April 3, 1921. He lives at the Paulist motherhouse on West 59th Street in New York City, just blocks from where he was raised on Manhattan’s West Side. Fr. Lloyd's mother and father were performers on the vaudeville circuit. From 1948 to 1955, Fr. Lloyd was a missionary in South Africa. 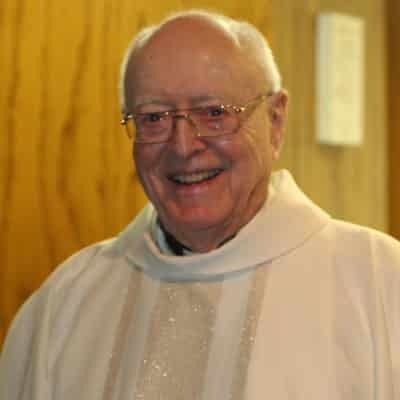 He led the Paulist Fathers' Catholic Information Center near Columbus Circle in New York City from 1955 to 1965. From 1958 to 1973, Fr. Lloyd hosted "Inquiry," a Sunday morning television program on WNBC (Channel 4), NBC's affiliate in New York City. The program featured Fr. Lloyd interviewing authors, public officials and celebrities, including Mother Theresa, Jackie Gleason, William F. Buckley and Florence Henderson. From 1965 to 1968, he led St. Peter's Seminary, our former junior seminary in Baltimore, MD. In 1973, Fr. Lloyd earned a Ph.D. in psychology from New York University’s School of Education (now NYU’s Steinhardt School of Culture, Education, and Human Development). For 20 years, he worked at Iona College as a professor and director of the college's graduate division of pastoral counseling. He also taught courses at St. Joseph's Seminary in Yonkers, NY. Today, Fr. Lloyd continues to hear confessions and provide pro bono counseling services. For his 70th Ordination Anniversary in 2018, Fr. Lloyd shared his perspectives on the priesthood and discernment. Watch the series of six videos below or on or on YouTube to hear what he had to say. Visit Pinterest for more photos and videos from Fr. Lloyd's long life and ministry.